Written by admin on June 7th, 2014 . Rosy Rhubarb has been going on for 22 years. Each year the funds raised have been poured back into the community. Helping to build Keystone Complex and the War Memorial and currently the new Library. We only had 7 people for the first walk but the weather was mild and sunny. 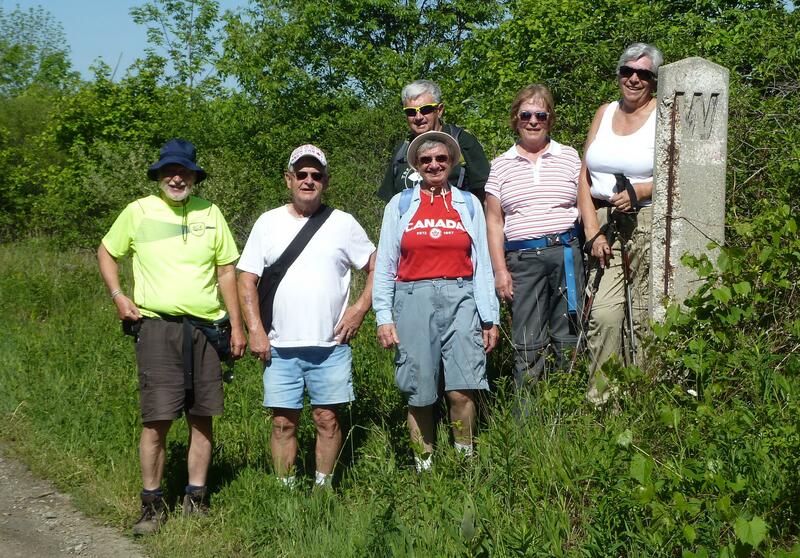 A deer walked in front of the group on Blind Line and a turkey vulture was seen sunning itself on a hydro tower. Jackie heard bobolink, but neither of us were able to spot them. In the wet spots the mosquitoes were active, always take deet when hiking. The hike turned out to be 9.5 kms, just long enough for everyone to work up an appetite. The Dutton Lions club prepared a great breakfast for everyone. Some people still had room for rhubarb sauce and ice cream. After a brief walk around Rosy Rhubarb we headed back to the cars. Thanks to Jim Northey for suggesting and planning this hike. We are all looking forward to doing it again, weather willing in 2015.